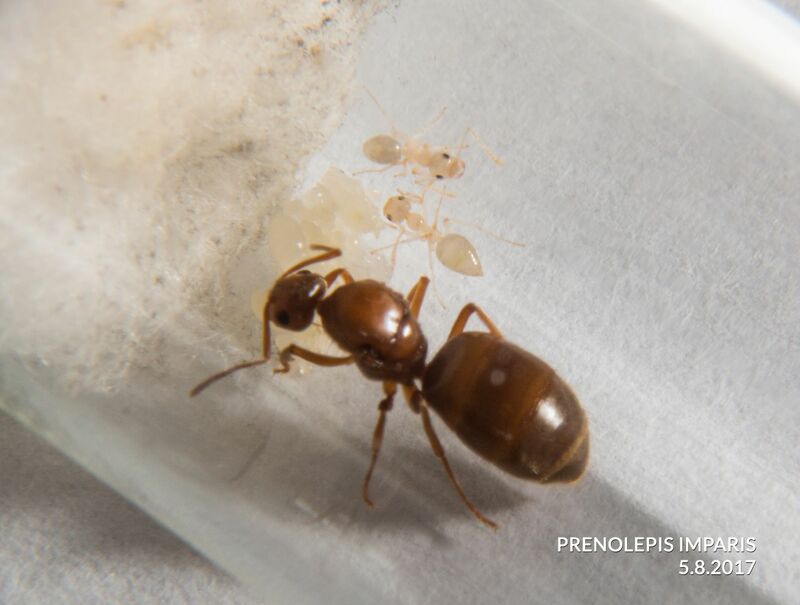 Part of keeping ants is gaining information from others, including trials, errors and failures. 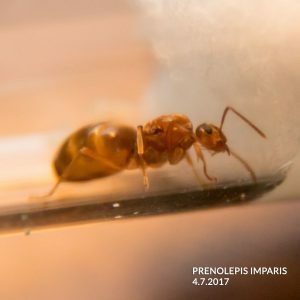 This is an account of my collection and tracking of the “False Honeypot Ant” – Prenolepis imparis. I collected 12 females on February 24th, 2017 on a wooded path around Cobb Lake in Bluffton, Ohio. Here is a Google Maps link to the collection location.We had an unusual 2-3 days in the mid 60’s which seemed to trigger the nuptial flights. All of these were either spotted walking, or found after moving loose leaf litter. 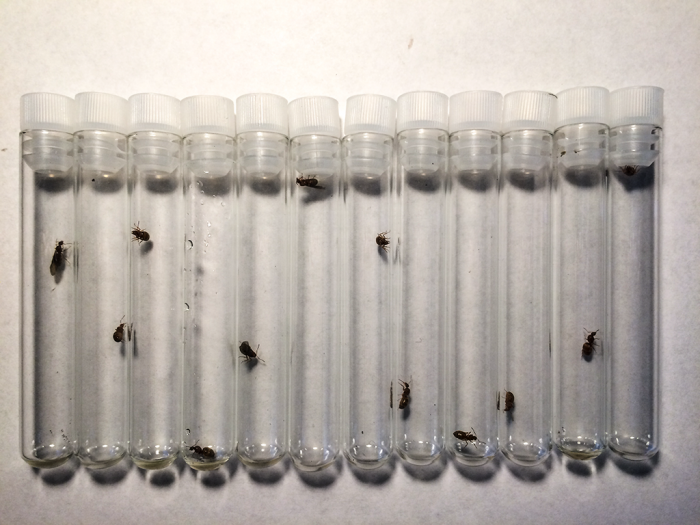 Thinking back to the time I caught the queens, we had 7 consecutive days above 60. (63,70,64,63,63,62) Here is the weather information for the day I captured the queens. Barometric: Dropping, although the hour I caught them the pressure jumped briefly. Collected all 12 of these females in Northwest Ohio, on February 24th 2017. First attempt at Ant Keeping. Currently, they reside in test tubes with cotton, in a cardboard box on the top m closet shelf, approximately 65-68F. After 2 weeks of captivity, I have noticed eggs in at least 8 of the test tubes. I am being careful not to check too often in fears of disturbing the queens. 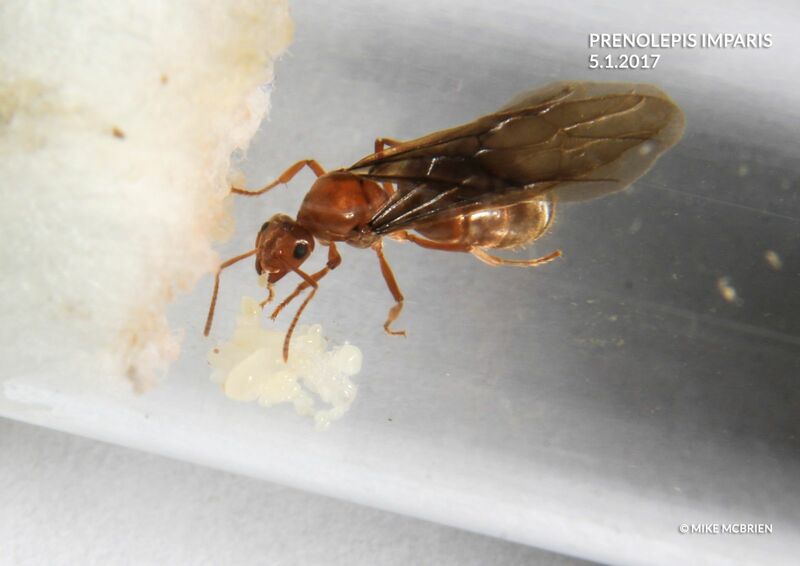 Notably, one of the queens with wings laid eggs, and still has the wings as of 3.23.2017. Just a few more photos, more eggs, better lens. Still liking the queen with wings! I have been trying my hardest to limit the interaction I have to around once a week until some workers are present with the queen. Most of the Broods seem to be doing well, increasing in both numbers and some pretty obvious larvae at this stage, which is exciting. I took the opportunity to go ahead and try my hand at some more photos, and I am now realizing how hard it is to get great captures through not only round test tubes, but cheap test tubes. Light is hard and the extrusion lines in the glass are readily apparent at these focus and zoom levels. Of the 12 queens captured, 3 still have their wings. 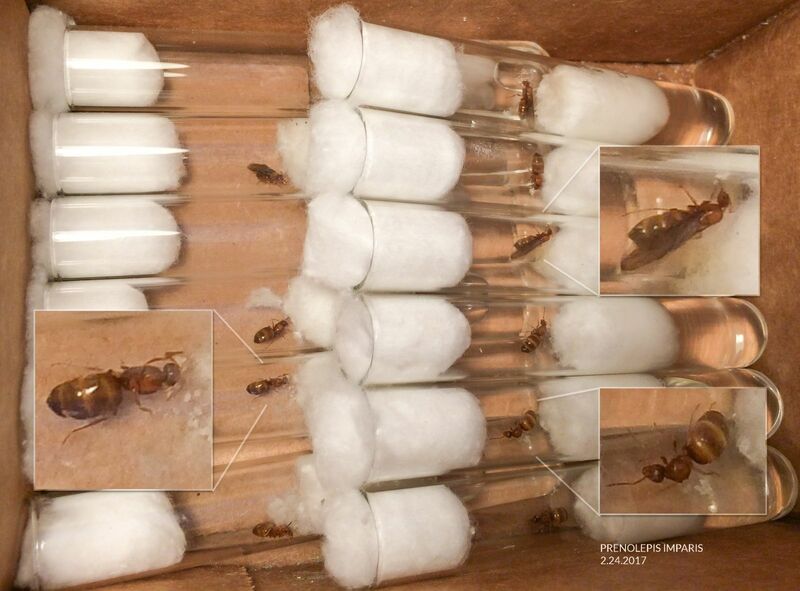 As of today, I have had these nuptial queens in captivity for 43 Days. 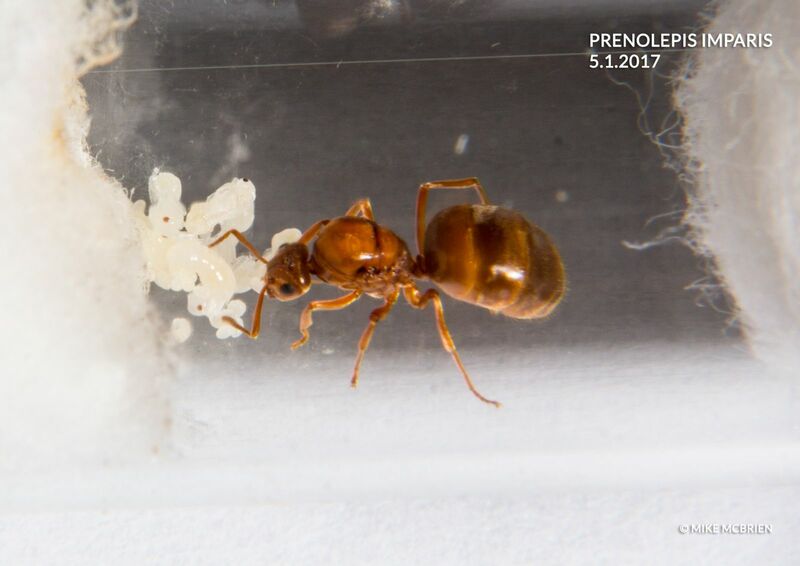 Shots of queens with eggs. I also captured a quick, but boring video by hand. It’s shakey but I am letting youtube do some stabilization. I’ll make sure I get my tripod out next time. 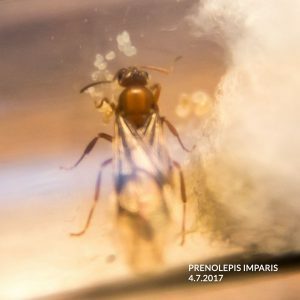 An exciting update, we have Pupae with visible eyes and legs! It’s been a few weeks since my last post as I got busy with a few other things and didn’t have the time to get the camera gear out. I could of observations. I have 2 test tubes that appear to be absorbing water fast that others, this is likely due to my inexperience of loading the tubes and I pushed the cotton too far. 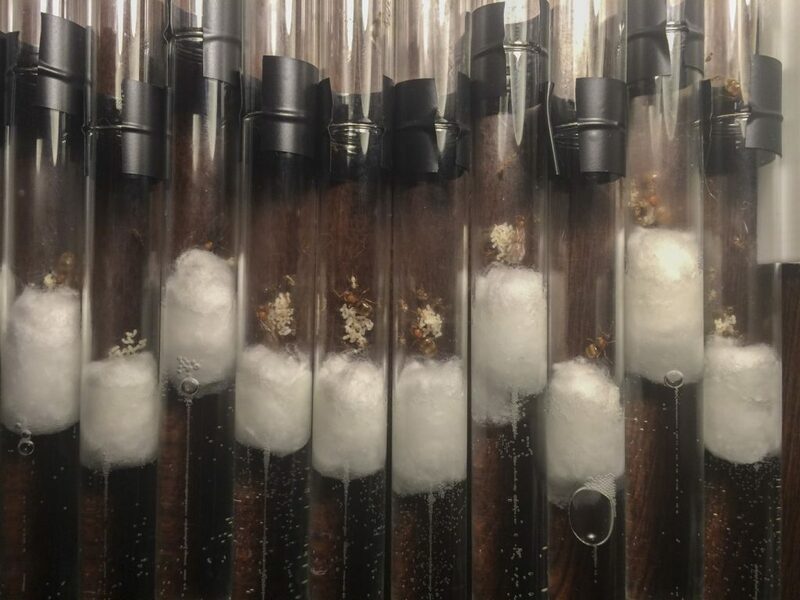 I will continue to monitor these tubes and prepare to move the queens if the water becomes too low. Last week’s update was exciting, but this week’s update is monumental. 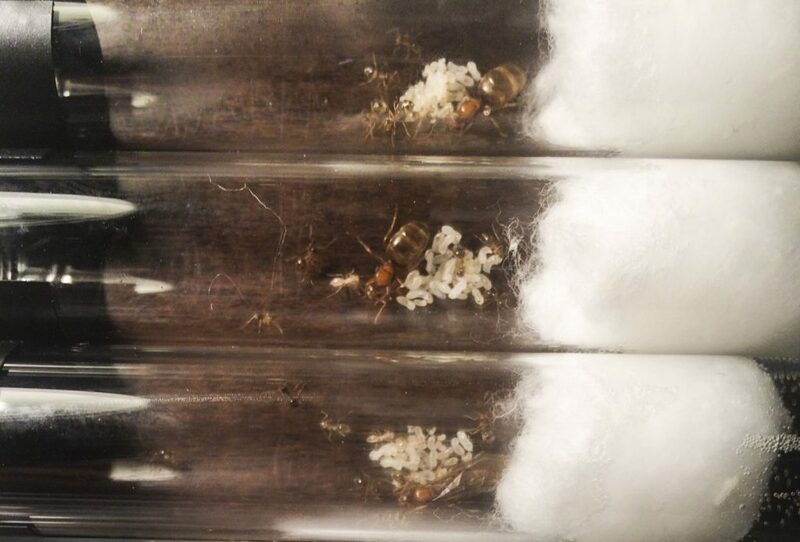 4 of my queens now have their very first nanitics! 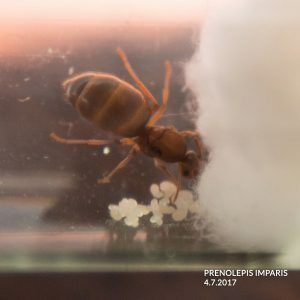 I fed a drop of honey to each tube with Nanitics and saw 3 of the four tubes have the nanitics ingest and feed the queen through trophallaxis. My first time to witness this and it was pretty sweet. It’s simply amazing how the ants just know what to do. The tubes with lower water appear to be about the same as the previous week and I will continue to monitor it. I also had one queen which had mold growing pretty heavily on the cotton, and sometime between last week and this week she didn’t make it. Not too much to add here, colonies are growing, I have been giving drops of honey every 2-3 days, need to introduce some protein soon! 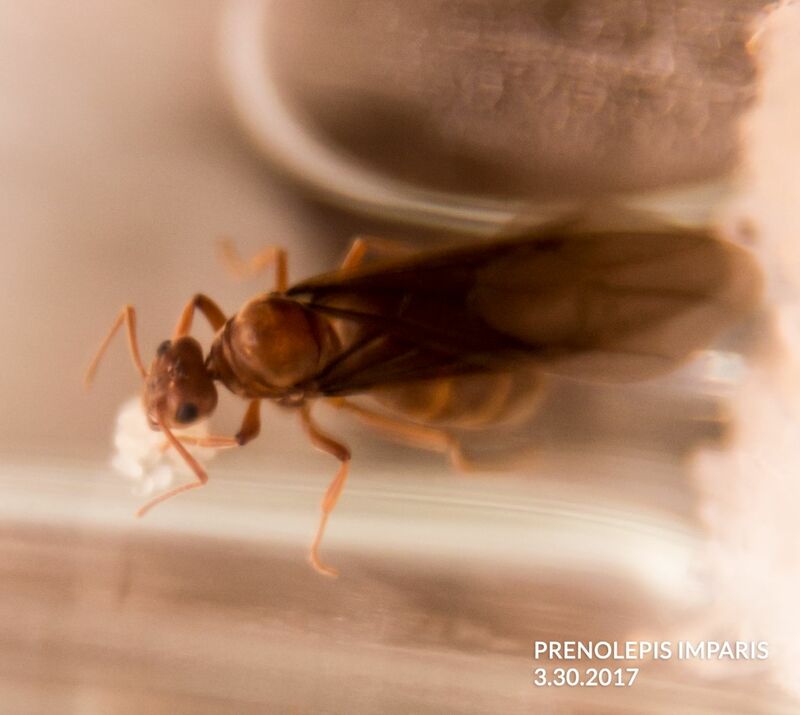 It has been just over a month and a lot has been going on with the colonies that have been mostly self-sufficient since I collected them. 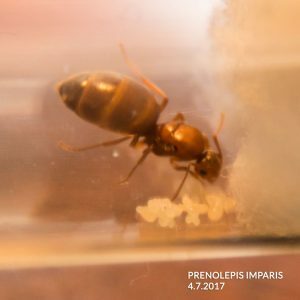 One week ago was the first protein I provided my colonies, each one received random bugs that I caught from my local area (pesticide free). Some had mosquitos, colonies shared a cricket that I smashed and divided, and the remainder had fruit flies. Each colony accepted the food I provided and seemed quite pleased. up until this point, I had been feeding my colonies at a small drop of honey, at least once a week. On an observation note, some colonies can sense/smell the honey as soon as I open the test tube and hold it near. They will begin to become semi-frantic and will quickly line up around the droplet filling their gasters. 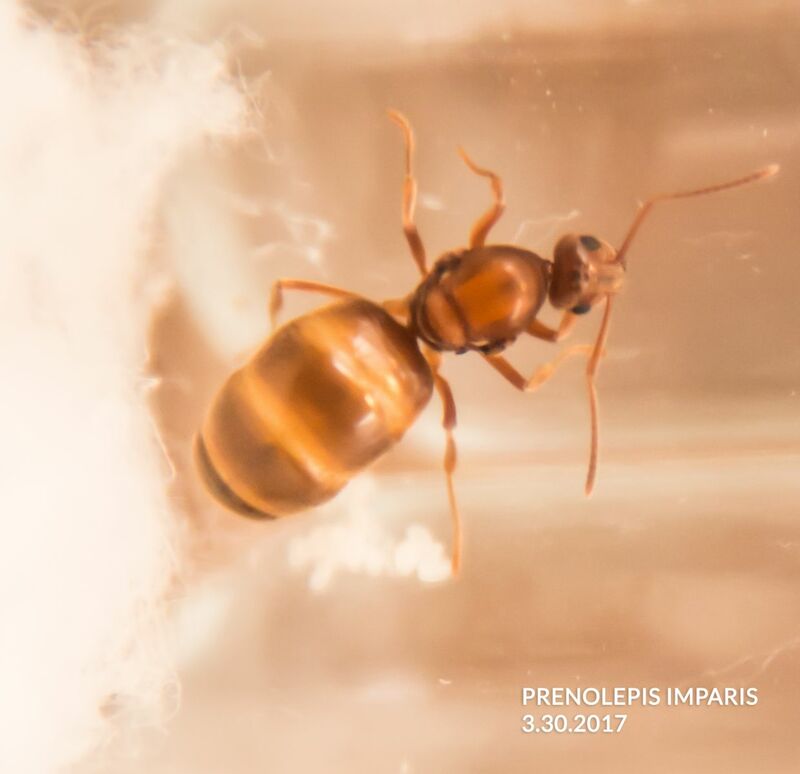 however I have one colony that seems completely indifferent to the honey – eventually, they will approach the drop, but it won’t happen until they are put away. I don’t know if each colony can have different personalities, but it is certainly what I am observing. Last night I chose to change all of my test tubes since a few were running dry, some were dirty and some were getting moldy. The process was quite simple and straightforward. I prepared new test tubes and filled them with RO water, then used electrical tape to attach both ends. then I set the old tubes on a heating wire and immediately the colonies began picking up the brood and began searching for a new location. After about 45 min all the colonies had moved. 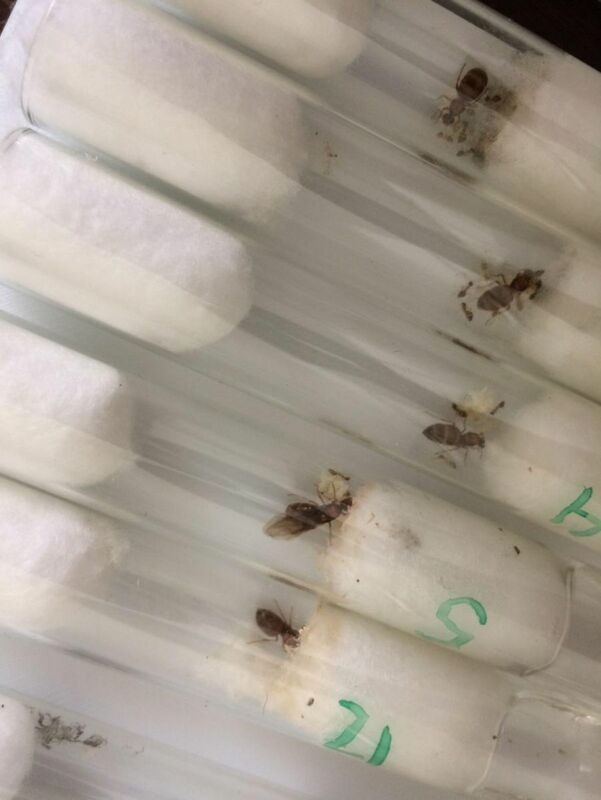 The colonies that did not have any Nanitics (ie – queen only ) took about 5 hours to fully relocate. After the move I was surprised how large the brood pile actually were, many of them must have been hiding in the cotton. So everyone is fed and moved to clean quarters and things are progressing. 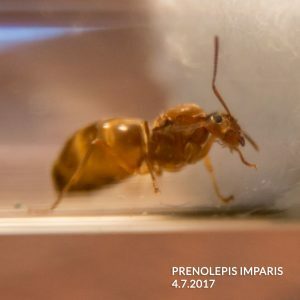 I apologize for not grabbing fantastic photos of this process but I did snap a few of the large brood piles with my phone, enjoy!